Now, the story of a president whose promise was abruptly cancelled, and the dysfunctional opposition that can't seem to keep it together. He rose -- from humble beginnings in the Hawaii-based marijuana smoking organization the Choom Gang -- through Occidental College, the Ivy League, and the U.S. Senate, all the way to the presidency, where he dreamed of redeeming the dreams of his father and repudiating his predecessor's policies. His name is George 2. One time he dressed in a flight suit, landed on an aircraft carrier, and gave a speech beneath a gigantic banner that proclaimed "Mission Accomplished," referring to a war that wouldn't end for another nine years, at which point its staunchest supporters insisted the mission still wasn't accomplished. Last week, Barack gave a big speech. Roughly five years ago, when he took over for George 2, he'd promised to change course in the conflict formerly known as the Global War on Terror, which he still wages against terrorists all over the globe. Vowing to stop torturing people, he made good on his pledge, waterboarding zero suspected terrorists, but killing thousands without capturing them. Having assured a reporter, "I reject the Bush Administration's claim that the president has plenary authority under the Constitution to detain U.S. citizens without charges as unlawful enemy combatants," he killed four U.S. citizens without charges. Insisting that "it is illegal and unwise for the President to disregard international human rights treaties ... ratified by the U.S. Senate," he disregarded the Convention Against Torture, an international human rights treaty ratified in 1994 by the U.S. Senate. It's all darkly funny when you think about it. After spending Cuatro de Mayo 2013 on a friendly visit to Mexico and Costa Rica, Barack gave that May 23 speech. His earliest supporters received it as the thing for which they'd long hoped: a reprieve for the abruptly cancelled project to rein in the War on Terror. By coincidence, the speech was given around the same time that Netflix posted 15 new episodes of the groundbreaking tragicomedy Arrested Development, set in Orange County, California. The events seem to have bled together for me. The show is known for its biting, absurdist humor. But is it any more absurd than the real-life characters and events I've been observing on the national stage my whole adult life? Hadn't George 2 nicknamed his top adviser Turd Blossom and declared that the lowest moment of his presidency was when he was insulted by luxury rapper Kanye West? 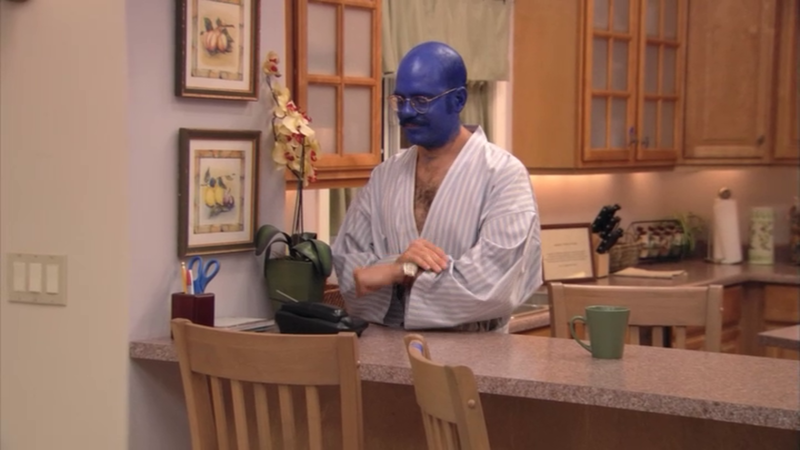 Isn't Herman Cain every bit as ridiculous as Herbert Love, the Arrested Development Season 4 character he inspired? Wasn't Barack ... well, we're getting to that. After the speech, more than one observer grokked Barack's intended message: "Please don't worry, liberals. I'm not George ." Conor Friedersdorf of The Atlantic -- hey, that's me! -- called the speech a rhetorical victory for civil libertarians. Like me, James Fallows, who's been wanting to declare the War on Terrorism over and won since his excellent 2006 Atlantic cover story on the subject, celebrated the speech's nod in that direction (even as the Pentagon speculated about 10 to 20 more years of war against al-Qaeda and the White House finished institutionalizing its disposition matrix). Wrote The New Yorker's Jane Mayer, who has done pioneering work investigating the War on Terror excesses of George 2 as well as Barack's ongoing war on whistleblowers, "While [George 2] frequently seemed to take action without considering the underlying questions, [Barack] appears somewhat unsure of exactly what actions to take." This is how desperate War on Terror critics are. Conflicted words from a man with a history of breaking his, and that man's apparent moral doubts about his own actions, are enough to make us cautiously optimistic. It could be worse. At least the teams of SEALs we deploy haven't gone rogue. Until yesterday, the whole situation had me feeling blue. It took Rep. Peter King, a New York Republican, to get me laughing at the tragicomedy again. On one hand, you've got what Tom Junod calls "The Lethal President" ensconced in the White House, having asserted for himself the power to kill in secret (based on legal theories he won't share with the public) thousands of times. He gave a speech in which he indicates, with no promise of stopping, that maybe it would be a bad thing for America if we were permanently at war. And that proved to be too much for Peter. Does the drone program need to change? "If it does change it shouldn't change for moral reasons," he said. "That's what bothered me about the president's speech. It was moral anguish that he was going through." The guy killing in secret based on standards he keeps secret expresses "moral anguish" about a semi-targeted killing program that has killed hundreds of innocent people ... and Rep. Peter is certain that he's wrong to feel any moral anguish! It doesn't really matter what Barack does. Thus the two choices before Americans in the realm of national security: A Team Blue that pays rhetorical lip service to eventually ending the War on Terrorism, at an unspecified date, even as Team Blue leaders openly plan to wage it for the foreseeable future; and an opposition party that also plans to wage it for the foreseeable future, but is dead set against rhetoric suggesting that it should end sometime. Says Glenn Greenwald, summing up American politics since September of 2001, "The cosmopolitan, intellectualized flavor of [Barack's] advocacy makes coastal elites and blue state progressives instinctively confident in the Goodness of whatever he's selling, much as George [2's] swaggering, evangelical cowboy routine did for red state conservatives." And the cosmopolitan, intellectualized flavor of Barack's advocacy makes red-state conservatives confident in the Badness of whatever he's selling, even when he's doing what they're selling (though they'd do it with more swagger, costing them the support of coastal elites and blue state progressives). It's all very serious stuff with terrible consequences here and abroad. But without occasionally laughing at its terrible, truth-is-stranger-than-fiction absurdity, we'd probably be driven to Forget-Me-Nows.